I unleashed these fellas at an impromptu dinner gathering over at my mumses house where the entire taster ensemble was related to me. Ergo, there isn’t a lot of sugar coating on their statements of review. Actually, it was mostly Sis who was all up in arms about the displeasing aspect of these cookies, but she might still be remembering the last JSF I surprised them with. Sis has a long and vengeful memory sometimes. Still, NY Sable are cookies and cookies can be delicious, for the most part, so my fam dug in and took one for the team. 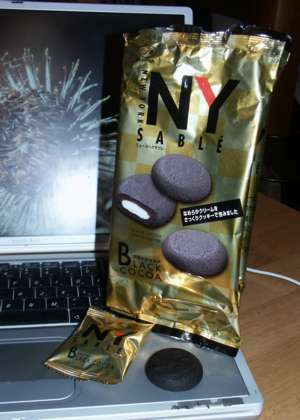 NY Sable Black Cocoa are sort of a Famous Chocolate Wafer like cookie stuffed with a gooey quasi creamy vanilla like substance. They are very cool little cookies in construction because they aren’t a cream sandwich cookie but rather the gooey part is nestled inside the cookie bit. It’s like a secret cookie pocket full of gooey goo! Excellent! However, my Sis was firmly set on describing them as “stale Oreo cookies [with] runny tasteless Oreo cream”. She would like you to know that she does not give her Sis stamp of approval on these. Nosiree Bob. The rest of us were mixed on the merits and disappointments of these NY Sable Black Cocoa cookies. They smell more cocoa-y than they taste, which is disappointing, and the gooey cream has a bit of an artificial taint to it. I don’t think the artificial flavor is too hideous, but it does hover oddly about the edge of your taste. On the plus side, the gooey center is a nice consistency. It’s less Oreo middle-like and more frosting-like in consistency, which I’m pretty keen about. The cookie part is very light and not really substantial but it’s not bad. In fact, the rest of us Pigs found that the more we ate, the more we sorta liked these cookies. We even discovered that if you hold them in your mouth for a bit, the cookie part melts nicely and seems to improve the cookie eating experience. Mind you, we weren’t going to go all out and buy stock in NY Sable Black Cocoa cookies, and mumses’s store brand frosted sugar cookies disappeared long before most of the NY Sable’s were touched, but we did eat them. Eventually. They weren’t bad with coffee.